As the only company with every type of needle in cartridge form, TATSoul offers a diverse range of configurations with special attention to quality and performance. 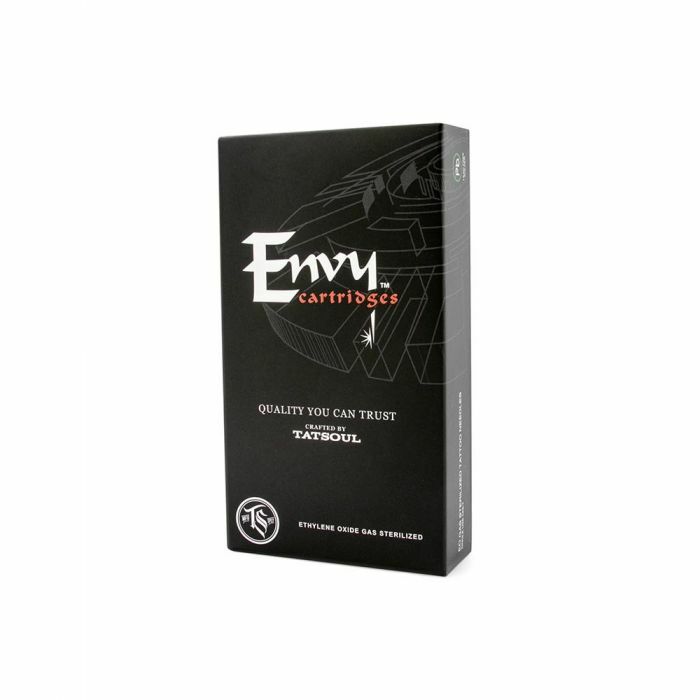 Envy Cartridge Needles are set apart from other tattoo cartridges in the industry because of their one piece needle and plunger overmold, allowing for maximum stability and ultimate control. The membrane and tip of these needles allow artists to enjoy a more fluid tattooing procedure; the membrane mechanism prevents ink spitback, while a small indentation at the tip works to enhance ink flow and saturation. Every Envy Cartridge Needle features an Envy needle pin that must pass a 30-point inspection, including pin alignment and solder distribution. Each needle is EO gas sterilized and individually packaged for single-use only. This listing is for one box of 10 Envy Standard Cartridge Needles. Envy Standard Cartridges are everyday needles designed for a variety of work, from lining to shading. These #12 needle cartridges have a polished, long taper and are available in Round Liner, Magnum, Curved Magnum, and Round Shader; please select your desired grouping from the drop-down menu.